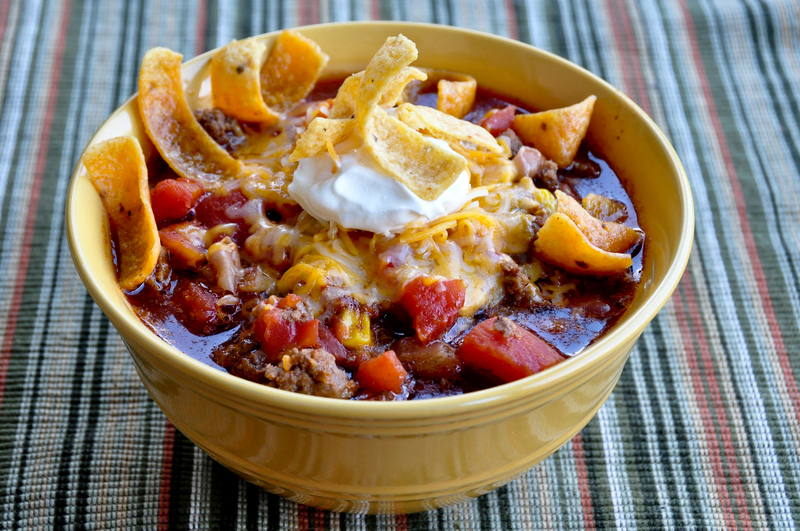 Taco Soup – Mama, Can I Lick the Spoon? Today was our first day back to school after Thanksgiving break. Only three weeks until Christmas break and the kids are wound up! They are more chatty than usual – and that’s saying something! – they are more wiggly, more giggly, more EVERYTHING! If you’re a teacher, you will understand when I say that we are officially in survival mode. We will hold it together and keep order in the classroom and teach meaningful lessons – and every now and then, we will scrape a couple of kids off the ceiling and keep on going! In the long days ahead, I will be glad that I cooked big batches of some meals and froze half. I will rejoice to find a pan of Beefy Mac or a bag of gumbo in the back of the freezer. Anything that means I can just warm up dinner and relax! This is definitely one of those meals. There are lots of recipes for Taco Soup. It’s a great, hearty, savory soup – and my recipe makes a LOT. I mean it. Like, you can eat all you want and freeze half and take it to work every day for a week and you will still have some left! The best part of this recipe is that, after your brown the meat, everything else is pretty much just dumped in! Brown hamburger meat with chopped onion. Add remaining ingredients. Bring to a boil, then cook on low for 30 minutes. Well Duh #1: You can use ground turkey instead of ground beef. I usually do. Well Duh #2: You didn’t read that wrong. The corn is the only thing you drain. Well Duh #3: In our family, we like to put crushed Fritos and shredded cheddar in the bottom of our bowls before ladling the hot soup on top. By the time we stir to combine, the cheese is melted. We also like to top it with a dollop of sour cream. Well Duh #4: I usually use the mild Rotel because not everyone in my family likes really spicy food. If you want to use the hot ones, you can. Well Duh #5: If you can’t find the pinto beans with jalapenos, just use four cans total of regular pinto beans and add another can of Rotel. Well Duh #6: While the meat is browning, go ahead and open all of your cans and drain the corn. That way, you’re ready to go as soon as the meat is done. Three more weeks. We can do this!